Canmore hiking trails are usually passed by in favour of those of its famous neighbours, but some interesting trails do exist. Paved paths around town are suitable for walking, bicycling, and, in winter, skiing. They link Policeman’s Creek with the golf course, Nordic center, and Riverview Park on the Bow River. This historical trail climbs to two small lakes below Ha Ling Peak. From the parking lot just off Spray Lakes Road, take the left fork 150 meters (0.1 mile) along the trail. It climbs steadily to stairs cut into a cliff face before leading up to a bridge over Canmore Creek and to the lakes. Interpretive signs along the trail point out interesting aspects of the Bow Valley and detail the life of Lawrence Grassi, who built the trail in the early 1920s. 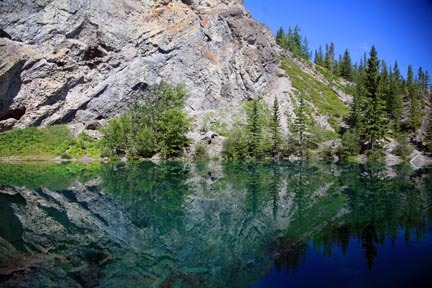 With Ha Ling Peak as a backdrop, these gin-clear, spring-fed lakes are a particularly rewarding destination. 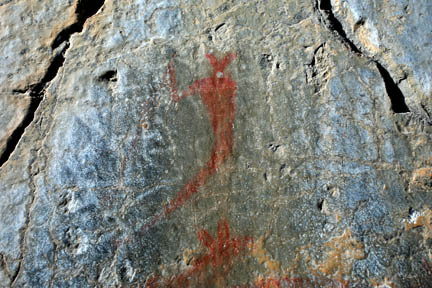 Behind the upper lake, an easy scramble up a scree slope leads to four pictographs (First Nations rock paintings) of human figures. They are on the first large boulder in the gorge. An alternate return route is down a rough access road between the hiking trail and Spray Lakes Road, passing a broken-down log cabin along the way. Ha Ling Peak is the impressive pinnacle of rock that rises high above Canmore to the southwest. While the sheer eastern face is visible from town, this trail winds up the back side of the mountain and ends with stunning views across the Bow Valley. Leaving your vehicle at the Goat Creek Trailhead, cross the road, then walk up to and over the canal to search out the trail, which begins from behind a small work shed. The trail climbs steadily through subalpine forest of Engelmann spruce before breaking out above the tree line, where views north extend down the glacially carved Goat Creek Valley. The trail then forks; the left fork climbs unforgivingly to Chinaman’s Peak, but hikers are rewarded with views no less spectacular by continuing to the right along a lightly marked trail that ends at a saddle. On a clear day, the panorama afforded from this viewpoint is worth every painful step. Take care on the return journey; stay high and to the right, and watch for rock cairns and colored flagging to ensure you enter the trees at the right spot. Named for the wife of Canada’s first prime minister, this peak lies immediately north of Canmore. Follow Cougar Creek to where the canyon begins, and look for a faint trail winding up a grassy bank to the left. Once on the trail, take the steepest option at every fork, then a sharp right 300 meters (0.2 mile) after the trail bursts out into a cleared area. This section is steep, climbing through a rock band to the mountain’s southern ridge, which you’ll follow the rest of the way. The distance and elevation listed are to an unused helipad below the main summit. It’s a steep, unrelenting slog, but views across the Bow Valley are stunning. From this point, the true summit is another 275 vertical meters (900 vertical feet) away, along an extremely narrow ridge that drops away precipitously to the east. Pictographs along the side of Grotto Canyon. This is one of the most interesting trails around Canmore, although it was ravaged by floodwaters in 2013. From Grotto Pond, this trail first follows a power-line road behind the Baymag plant. Then at a signed intersection it takes off to the north (right) through the woods to the mouth of the canyon. 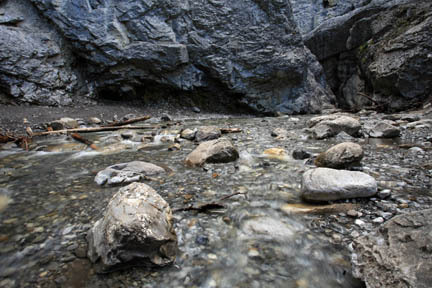 No official trail traverses the canyon; hikers simply follow the creekbed through the towering canyon walls. Around 300 meters (0.2 mile) into the canyon, look for pictographs on the cliffs to the left (just before a sharp bend in the creekbed); these historic rock paintings have survived the effects of years of curious hands, and just as surprisingly the floodwaters of 2013. At the two-kilometer (1.2-mile) mark, the canyon makes a sharp left turn at Illusion Rock, where water cascades through a narrow chasm and into the main canyon. Many hikers return from this point, but through the next section of canyon, the valley opens up, passing hoodoos and a cave. It’s 6.5 kilometers (four miles) from the trailhead to the end of the valley, with most of the 680 meters (2,230 feet) of elevation gained in the last two kilometers (1.2 miles). NOTE: This trail is not passable until July as spring runoff fills the creek bed. The trail ends where Heart Creek emerges from a narrow chasm. This well-formed trail is signposted from the Lac des Arcs interchange, 15 kilometers (9.3 miles) east of Canmore along the TransCanada Highway. The trail parallels the highway eastward until reaching a fork. The trail to the right follows Heart Creek for just over one kilometer (0.6 mile), crossing the creek seven times on narrow log bridges. It ends at a cleared area below a spot where Heart Creek is forced through a narrow cleft. Those tempted to continue farther can cross the creek, scramble up a steep, forested ridge, then descend the other side to link up with the creek upstream of the gorge. Cross the creek again for views of another narrow chasm. Heli-hiking is the summer alternative to heli-skiing–a helicopter does the hard work, and you get to hike in a remote, alpine region that would usually entail a long, steep hike to access. Alpine Helicopters (403/678-4802) offers options starting at $489 per person, which includes 10 minutes of flight time and 3 to 4 hours of hiking. The company is flexible, with ground time and destinations chosen by the clients. Flightseeing (no landing) costs $239 for 25 minutes of air time. The heliport is along Highway 1A south of downtown. Try to book ahead for these trips; they’re very popular with travelers staying in Banff, where there is no flightseeing.